Last week, we released something that we’ve been working on for a while in the VR Lab: TurboSquid VR Galleries. In a nutshell, a VR Gallery is a standalone .EXE that anyone can download for free and explore in virtual reality using either an HTC Vive, or an Oculus Rift+Touch. 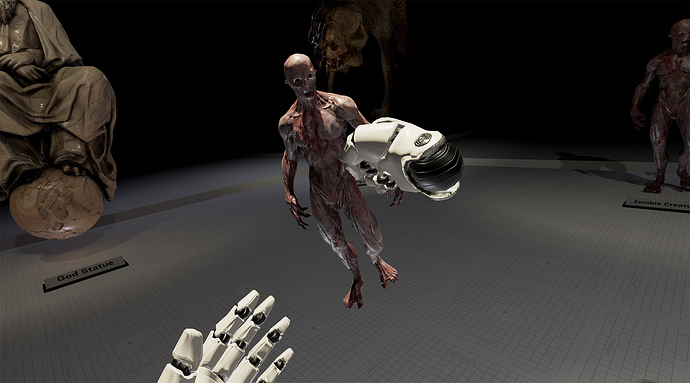 This first VR Gallery release features the work of TS Artist Cecoaliensa, whose zombies and creatures have been used in some of VR’s earliest hit titles. In the future we will be providing a free Unreal template that TurboSquid artists can use to easily create their own VR Galleries, with critical VR features like teleportation and hand-controller support already set up for both Rift and Vive. We’re doing everything we can to make it as easy as possible for artists to simply import, arrange, and light their own VR Galleries – or even single-model viewers. We’ll have more info soon on these tools, but in the meantime, if you have access to a Rift or a Vive, check out the Cecoaliensa gallery here and let us know what you think over in our discussion on the Squid.io forums.